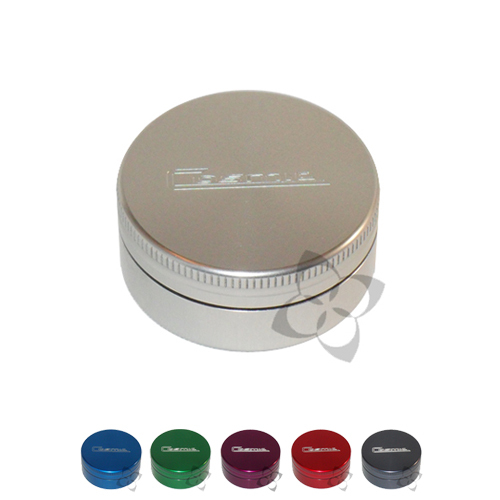 Pros: This grinder holds a considerable amount of aromatherapy products and efficiently and effectively grinds them without reducing them to powder. After a normal amount of grinding, the aromatherapy products are light and fluffy, yet perfectly ground. The fact that it is magnetized is amazing as well and ensures that the grinder stays together. A must buy. Cons: The only negative aspect to this grinder is that it gets dirty, but honestly, won't they all? Be aware that the "Mini" in the title is well deserved - this thing is very small. Not a problem for me since vaporizers require so little aromatherapy product anyway, but I felt I should point this out. Pros: It's a great little grinder. Magnetized aluminum's not the kind to let you down. Cons: Perhaps a bit overpriced? Most of your grinders seem to be actually. this is a well crafted little grinder that is going to bring me years of good use. For the money it should have a place to store aromatherapy product also, but overall i feel i made the right choice though I'm obviously bitter about the cost. On another note to others this grinder works so well only 2-3 quarter turn twists are needed, hope it helps a few people. Pros: This little thing is just great! Its stainless and stays clean. The magnet in it seals great, no smell escapes the grinder no matter how stinky your aromatherapy product. It fluffs your aromatherapy product perfectly. I'm glad I gave in and opted for the better grinder. Cons: The cost is really high but most grinders are. The difference is that this one will last you a lifetime and other plastic cheap deals will only last until you snag a tooth and it breaks.